Via the official Bumblebee: The Movie Twitter accountwe have a look the their Official Comic-Con Exclusive Poster. 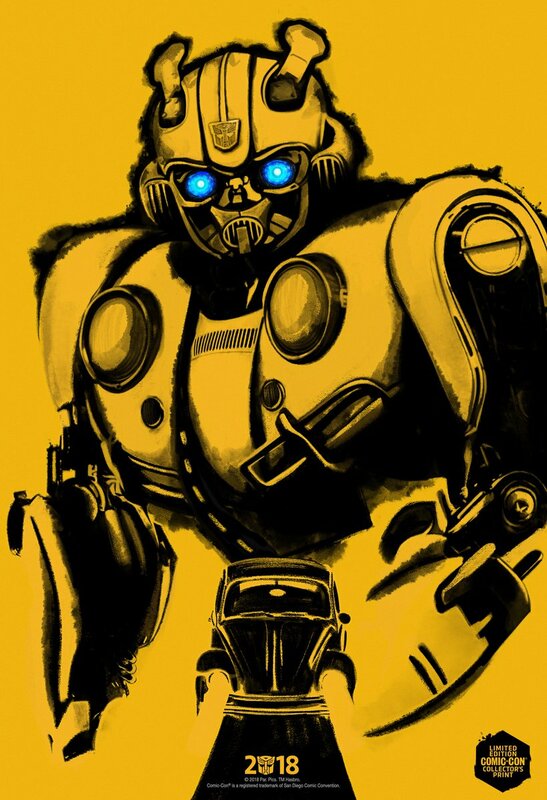 A very nice poster indeed, featuring a yellow and black composition of Bumblebee in both robot and alt mode. This poster is available at San Diego Comicon 2018 as a limited edition. You can check out the image after the jump and then let us know know your impressions on the 2005 Boards! Thanks, I'll check mine out. Is the poster 19×13? Nice! Where did you find the frame? I just want to clarify for anyone who wants to know that this poster was a given away at the Bumblebee movie panel at SDCC. You had to attend the hall H panel. Then they gave you a ticket to redeem at the Marriot Hotel. Blitzwing…..? I thought this movie was going to be different. It\'s seeming more and more bayish as time goes on. Does anyone know the measurements? I asked an Ebay seller and they replied with "full size poster"
Hard to tell but I saw an eBay listing where someone was holding it and it looked smaller than a 11×17 print. That is one sassy Bee, look at that dang pose. Can’t wait for mine to arrive!!! There are a few on eBay now. It’s an edition of 10,000 so shouldn’t be too hard to snag one.